While spending a couple of winter months in my beloved Marco Island, I became fascinated by the many varieties of Palm Trees throughout the landscape. In Florida, palm trees are ubiquitous, and there are so many different kinds. All are appealing, as they conjure thoughts of salubrious weather and relaxing times. 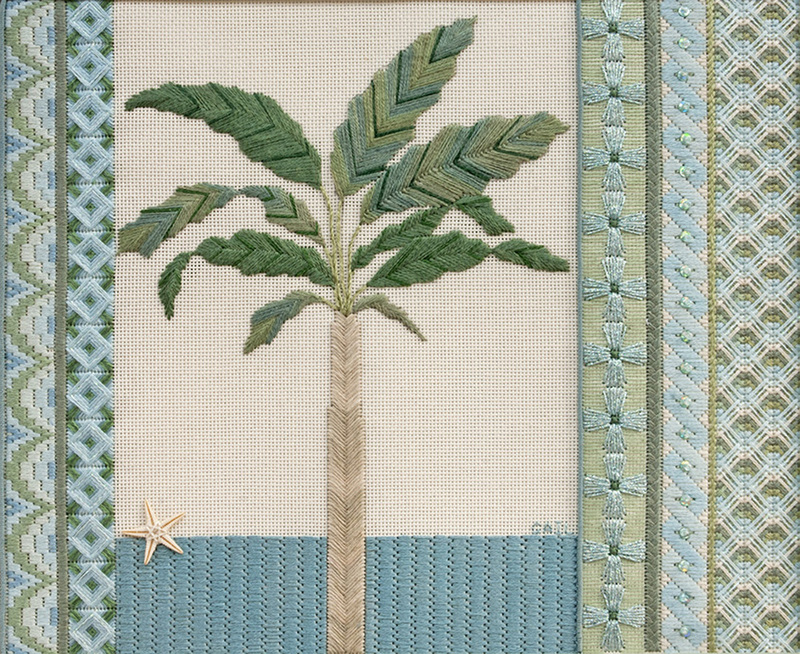 The palm tree has become an icon of the beautiful tropics, always beckoning the winter weary to its shores. I portray one single palm tree, but the borders are complex and interesting. The colors evoke the colors of the landscape, the greens of the foliage and the peaceful blue of the sea. The background congress cloth was employed to suggest the beach. I added a real sea star to give a suggestion of verisimilitude.